The course of the Colorado River followed for this report. One out of every 10 people in the U.S. depend on the lower Colorado for water. Among them, one third of all the Hispanics who live in the U.S. and many who work in agriculture, tourism and services along the riverbank. Authorities are increasingly worried about impending water shortages. As global temperatures rise and the Southwest grows, more pressure is put on the system. Meanwhile, the river’s level continues to drop due to overuse, evaporation and drought. Each year the lower Colorado uses an average of 1.2 million acre-feet of water—more than it receives naturally from the upper Colorado River basin flows. In other words, much more water is extracted from the river than it receives. That amount (1.2 million acre-feet of water) is what is required to supply two and a half million homes in the southwestern United States. It’s not an option to turn off the tap to these people. “Water is a necessity of the first order for all activities, without water the entire ecosystem is affected, as well as our traditions and lifestyles,” Mack explained. But where does that water come from if it is not from the river? This water comes from a kind of ‘savings account,’ that is, from river water that was collected and accumulated in huge dams over the past few decades when the demand for water was much lower. This water is what has kept taps running until now. But that savings account of water is drying up. The reservoirs known as Lake Powell and Lake Mead are currently facing historic lows (they are at 56% and 41% capacity, respectively). Also these reservoirs already lose 1.8 million acre-feet of water per year to evaportation, an amount equal to about 13% of the annual flow of the river. So far there aren’t any clear plans to make up for this annual shortfall. The shrinking snowpack and drought only exacerbate the problem further. How long will it be until the well so to speak runs dry? And if that happens: who will be the first to go without water? All the people and states involved in managing the lower basin of the Colorado River agree that each drop of water counts now more than ever, but the struggle continues as everyone keeps trying to defend their own water usage amounts. It is not entirely clear that this is the best system, but because of historic water agreements still in place, alternatives are lacking: a voluntary negotiation process is urgently needed to implement contingency plans in case of further drought. Touring the river basin, I was alarmed to see the low levels of water. It’s even more worrisome when one realizes that the basin is managed by 7 different states and two countries. It makes it more difficult to mange the crisis since so many parties with vested interests are competing for the rapidly decreasing water. For example, while in Nevada the authorities officially express concern for water and proudly show how they have invented ingenious systems to recycle and reuse 100% of the water used inside homes, they also keep irrigating some 60 golf courses, while still diverting water to gardens and swimming pools from the river in the Mojave Desert. Approximately 40 percent of the water in southern Nevada is used indoors, like in homes, where water can be recycled and put back into the system. Sixty percent of all water is used outdoors for landscaping and swimming pools and this water cannot be reintroduced into the water system. Enormous amounts of water are also used in California. The state is famous for growing “America’s food.” On farms in the Imperial Valley, Coachella and Palo Verde, water is used to grow citrus and vegetables in the desert. Touring the area, I also saw widescale irrigation for commodities like spices and alfalfa—destined mainly for export to Italy or China. Neighboring states often criticize California saying it would be better to leave the water in the local river system than to use it for export products. And in Arizona, which is one of the last on the list of water distribution priorities, the authorities dare to say publicly that “the situation is under control” and are even promoting new real estate developments and technological development companies that require large amounts of water. Each of the players within the river system has its own priorities and concerns, but they are increasingly in agreement that the risk of scarcity is unavoidable in the medium term. 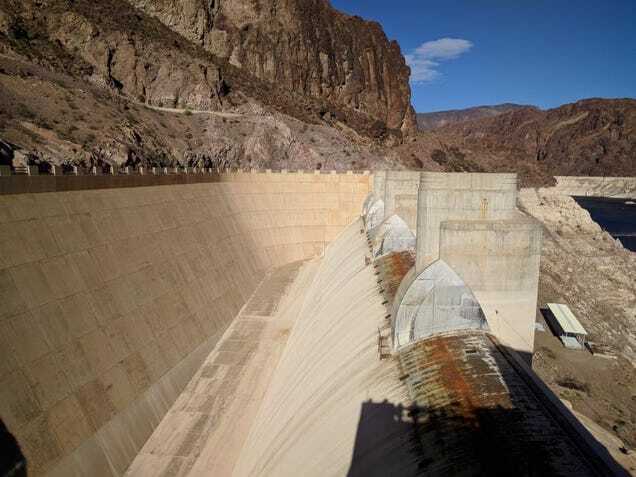 That’s why the federal government and the states of Arizona, California and Nevada have been negotiating the so-called Contingency Drought Plan (DCP) to help stabilize water supplies in the lower Colorado River basin. Through this initiative, states are considering additional voluntary water reductions to stabilize the system and avoid shortages. These savings should come from all sectors: agriculture, industry and cities. Univision consulted some of the states about the best and worst scenarios and what they consider to be the best bets to avoid running out of water. The answers were very diverse according to their location and rights to use water on the river. Mack says the current scenario and medium-term forecasts are not good news for southern Nevada, which depends on the Colorado River for 90% of its water supply. “The challenges created by the decrease in lake levels not only include less access to water but also challenges in the deterioration of the water quality by erosion in the lake,” he said. It’s important to note that Nevada has no historical rights in the river, so it is the smallest portion, 300,000 acres-feet per year. This has led to places like Las Vegas recovering 100% of the water used inside the house. Patrick Donnelly from the Center for Biological Diversity of Nevada says, “I think that excessive consumption of the Colorado River in Las Vegas has led to a false perception of impending scarcity. As a result, water managers have begun drawing plans to exploit groundwater resources in remote basins far away from Las Vegas, which have the potential to catastrophically affect the local environment.” In addition, he noted the urgency of reforming its water allocation policy to allocate more of it for wildlife and the environment. The inhabitants of Nevada pay an almost symbolic figure for each liter of water. Saving is not exactly a priority because all the water is ‘recycled’ and returned to the river, explains Pat Mulroy, a lawyer who dedicated 30 years of her life to the legislation that protects the river. Robert Cheng, Deputy Managing Director of California’s Coachella Valley Water District, says that the worst scenario for them would be that as the available supply of the river declines, water allocations and deliveries are changed in some way. Cheng celebrates the agreements with which the river is managed in the area at this time. “The fact that no state dependent on the Colorado River has experienced mandatory reductions, even though the Colorado River basin has been in drought conditions for several decades, shows that the ongoing process works. This report was made thanks to the support and mentoring of the Institute of Journalism and Natural Resources (IJNR).